It would have been redundant and possibly make the dialogue read less clearly, but I had really wanted Sam to mention how he'd always hope they didn't have enough guys for the male characters in plays he was in. When I first introduced Sam, I hadn't planned on him being, well, Sam. I was drawing a bunch of extras, and I was having fun putting way too many pockets on the guy in the front. When it came time to introduce Sam, however, I realized I already had this guy with a design I really liked. What's more, I felt the pockets were appropriate for Sam, as they both obscured his figure, and women's clothing often lacks actual functional pockets, and I liked Sam going overboard on pockets. ...Okay, if I'm being 100% honest, I wasn't thinking of the "obscuring his figure" angle at all. A lot of people have pointed that out, however, so it's still fitting! The reason I bring all of this up, however, is because that choice had another impact on Sam's character. Sam's theater and cosplay experience was inspired by the fact that I had given him facial hair, and I wanted a reason specific to him that he was capable of pulling that off. That theater and cosplay experience also lent itself well for Sam realizing things about himself. I made cosplay in particular a part of Sam's deal after seeing some truly amazing cosplay by women as male characters. 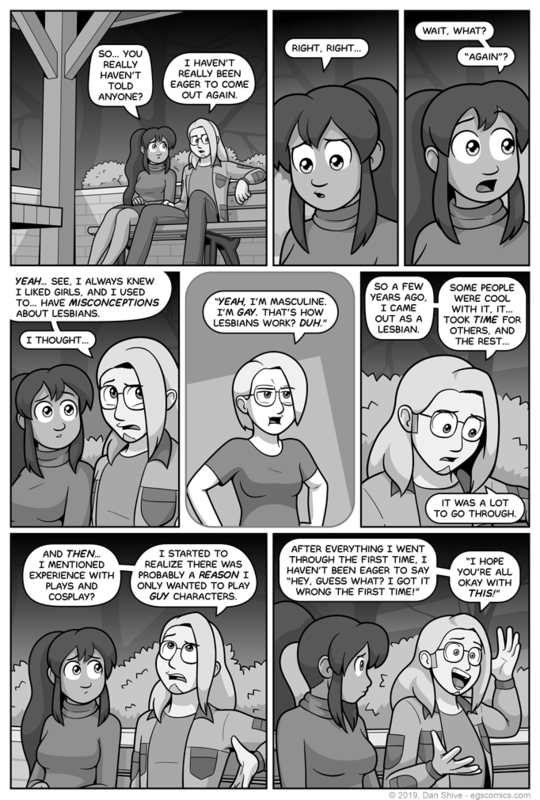 Sam having come out before is inspired by a lot of stories I've heard from people over the years. Not stories about this specifically happening, but just in general about how gradual discovery and reassessments can happen over time, and the sort of epiphanies that can happen about one's identity and how they can come about.